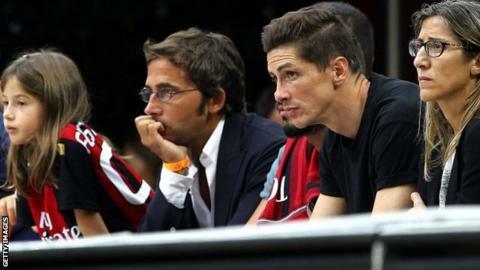 Spain striker Fernando Torres can "revive his career" at AC Milan, according to fellow summer signing Diego Lopez. Torres, 30, who joined from Chelsea last month on a two-year loan deal, is set to make his Milan debut in Sunday's Serie A trip to Parma. "Fernando has always done incredible things ," said goalkeeper Lopez, who signed from Real Madrid. "He will bring goals, speed, hard work and he can be very important." Torres moved to Chelsea from Liverpool for a then British record £50m in January 2011 but struggled to live up his price tag. The ex-Liverpool and Atletico Madrid striker scored 20 goals in 110 league appearances during his spell at Stamford Bridge, but helped the Blues win the 2012 Champions League. "Torres had a difficult year, but he has great desire to do well," said coach Filippo Inzaghi. "His physical tests were good and I hope that with him Milan will change greatly. "I have seven strikers and I'm spoilt for choice, my task is to get the most out of them and to understand how to inter-change between them." Milan finished a disappointing eighth last season, with managers Massimiliano Allegri and Clarence Seedorf both losing their jobs. But chief executive Adriano Galliani believes the seven-times European champions can stage a revival after opening their Serie A campaign with a 3-1 win at home to Lazio. "There's a positive aura," he said. "I can say that I feel electricity in the air around this new Milan. "Inzaghi's new Milan is bringing back the enthusiasm among our supporters and I remain optimistic."